Judging by the thin wood panel bolted to my home’s siding near the garden spigot, I could tell this was the spot the previous homeowner installed a garden hose reel. Although I preferred a rolling reel in which I could hide the hose or a stationary reel caddy that I could wind, I decided to follow suit because I didn’t want to remove the ugly wooden plank and expose bolt holes in my siding. In case you haven’t been in the market for one of these lately, most of the wall-mounted hose reels are not attractive! They consist of a) minimalistic plain metal or plastic saddle-style mounts, or b) obtrusive and large spin reels. Granted, there are a few decent looking models that consist of ornamental metal or inconspicuous winding reels. I had difficulty choosing a unit that was both aesthetically pleasing and functional. I decided that a winding reel mounted to the side of my house would be inconvenient not only due to its positioning directly in front of my wheeled garbage bins, but also due to how low the wooden plank was mounted. Bending over that far to reel in a 150-foot hose did not appeal to me, so saddle-style it was. I was not sure how a metal hose hanger would hold up over time, as it seemed somewhat flimsy and I worried about rust. I settled (and I mean settled) on an inexpensive Suncast stationary hose reel. The unit holds 150 feet of hose and I have not had an issue with overcrowding. I also never have had a problem with the unit becoming unmounted when raveling the hose around it. This unit has six pre-drilled holes for mounting. Because I already had two bolts mounted into my siding, it was not an issue for me that this unit did not come with attachment hardware. Nevertheless, I find it disagreeable that the manufacturer did not provide the essential hardware. There are really only two special features to this unit. First, it contains a small, handled compartment to store accessories such as spray nozzles or gloves, but I have yet to store anything in it. I am particularly hesitant to store anything metal in the compartment (i.e. clippers or pruners) in case I decide unexpectedly to hose off the unit—I doubt the compartment is leak-proof. If I do decide to use the storage compartment, I will likely install a small hook to secure items, as I can easily foresee the contents spilling out immediately when the door is opened. Second, the front panel can be lifted up and lowered to allow me to remove the entire hose at once, rather than unwinding. I have not been able to utilize this feature because the bolts securing the reel to the wall do not appear to be thoroughly secured, and lifting the panel results in removing the entire unit from the siding (that’s a project for another day). The nice feature about not being too attached to the wall is that I can easily remove it and store in the garage when winterizing. My main complaint with this unit is that the storage compartment fails to remain shut. Most days I come home from work to find it wide open. While I do not store anything in there, the open door becomes a hindrance because it must be closed every time I unwind the hose and every time I re-wind the hose. I am considering removing the door altogether or adding Velcro to compensate for the loose latch. Manufacturers should capitalize on the wall-mount hose reel market, because the selection is not vast. I think this unit will be more durable than its metal counterparts in the long run and it has held up very well so far. My expectations were low; I only expected this to last a season or two. While the matte plastic is not overly attractive, it is thick and doesn’t feel cheap. It also doesn’t reflect sunlight like some metal units do and it hasn’t dulled in color. 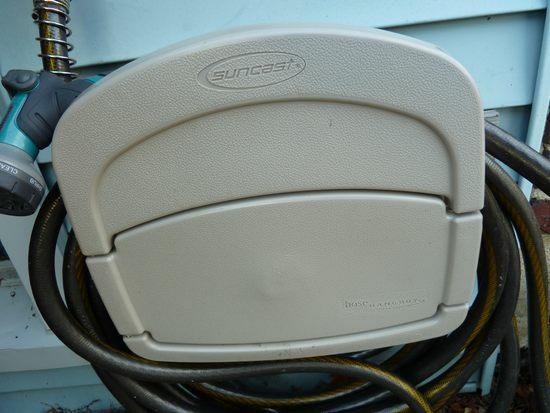 I am also in the market for a backyard hose reel and while this time I am not wedded to a wall-mounted style, I will consider buying another Suncast unit.